Dwight Chapel | 67 High St. 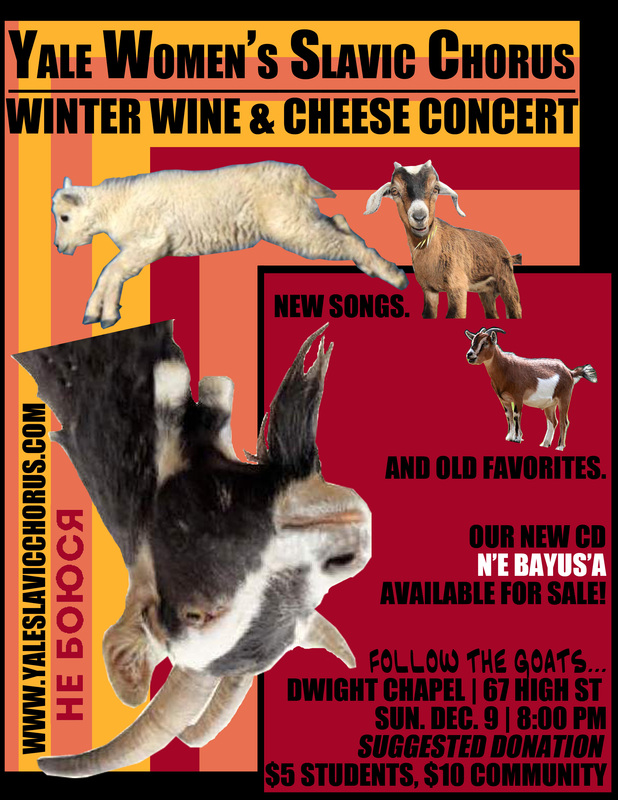 The Yale Slavic Chorus’s bi-annual Wine & Cheese Concert is our biggest on-campus concert of the semester–a celebration of winter, of cheese, of goats, of all things good. While we do not require ticketed admission, we suggest a donation of $5 for students and children and $10 for other community members. As you’ll notice, the event poster features a series of goats, an allusion to our newest album N’e Bayus’a! Copies of the album will be available for purchase at the concert, at prices of $15 for students and $20 for community. We are extremely proud of this creation and are delighted to share it with you and with the world! Interested in hearing more about the album? Unable to make it to the concert? Please join us for our CD Release Party! Hosted just a few days before our Wine & Cheese concert, we’ll be celebrating the album’s release with wonderful live music, good food, and great friends. We hope to see you there.